Effectively separating grease and oil deposits from waste water means water can be re-used, re-purposed, further treated to remove other impurities, or legally disposed of down sewers. Conventional degreasing solvents often hamper effective oil/ water separation by causing a chemical reaction that creates an oily emulsion. An emulsion is very difficult, costly and time consuming to separate through chemical or filtration methods. Triple7 Heavy Duty is a unique alternative to conventional degreasers and it does not form an oily emulsion. The product’s quick break formula effectively lifts and releases grease and oils. Oily contaminants separate from waste water, and rise to the top for easy removal. Reducing the volume of oily waste, significantly reduces the expense associated with its removal. A large iron ore producer has saved approximately $500,000 in waste water removal and disposal costs, over two and a half years, by substituting a conventional degreaser with Triple7 Heavy Duty. Large locomotives, that transport iron ore to ports around Australia for export, were regularly washed in train wash bays to remove greasy deposits. The chemical solvent used produced a strong emulsion which could not be effectively separated from waste water. Enormous quantities of oily waste water had to be removed and disposed of, creating an unsustainable expense. Triple7 Heavy Duty was selected to improve oil/ water separation and reduce oily waste water disposal costs. The product was so effective at optimising grease and oil removal, that the treated water could be safely used for dust suppression. This also saved the company water procurement costs. Triple7 Heavy Duty is an industry leading quick break degreaser that does not form an oily emulsion. The powerful degreaser lifts and releases greases and oil to the surface, to enhance the performance of oil/ water separation. 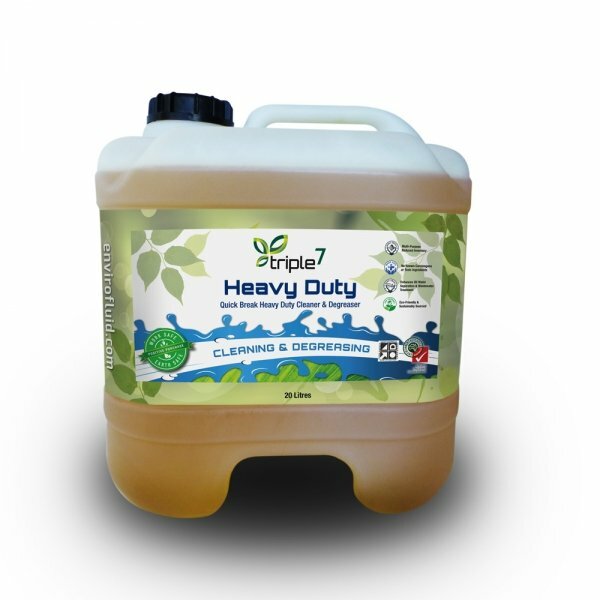 Triple7 Heavy Duty can dramatically decrease the costs associated with greasy waste water removal and disposal. Triple 7 Heavy Duty is non-corrosive and non-reactive with virtually every hard surface. This non-toxic and non-hazardous safer substitute protects workers from exposure to harmful chemicals and can reduce worker illness and sick days. Triple7 Heavy Duty has an enormous range of applications including heavy vehicles, trucks, trains, and aircraft. It reduces inventory purchase and storage requirements. It is safe and effective for any surface which can be rinsed with water.